I can't believe it's the last Wednesday of the month. I'm happy to report that I spent most of my weekend sewing, which means I have quite a few new things to share in the coming weeks! One of which you saw from my features last week (hint hint)! Here are a few of my favorite projects linked up from last week. If I featured your project make sure you grab a featured button and display it proudly on your blog! Felt Pillow from While they snooze. OK, so do you remember our guest blogger a few week's back? Sarah, who shared with us how she made a toddler tank dress? Yep, well she finally cracked and started her own blog!!! Sarah made this pillow last Fall and when she showed me her pictures I instantly fell in love with it! Make sure you visit Sarah's blog and show her some love! First off, if you didn't click on this link last week, click on it this week! I love her bedroom. I aspire for my master bedroom to look well put-together like Laurie's! I love how she transformed her auction find into an amazing nightstand!!! I love when you find something that is broken and looks like its on its last leg and revive it! 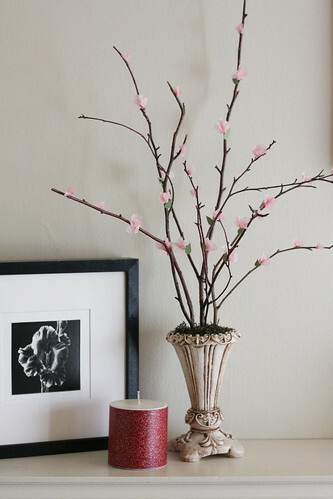 I absolutely love what she did with this lamp and am very inspired to try and revive a lamp myself! I love fabric headbands and they are all the rage right now! We had a craft lunch at work the other day, and I'm working on my very own "adult" fabric headband... post to come. I love this idea... I have so many old t-shirts just laying around... what a great way to jazz up a plain t-shirt and upcycle! -Please make sure you're following us (we'll follow you back as long as you leave us a comment telling us that you're a new follower)! -PLEASE display our party button either on your home page or on your post. -Please try to view and/or follow at least two other participants. I started these laundry room signs back in September, and they sat... for months. Until finally, I was tired of looking at them in my guest bedroom. I had finally decided how I would display them and what color scheme I was going for in the laundry room. I originally got the idea from CraftOManiac, and with some pre planing aka browsing the internet, I knew how I wanted to make these signs my own! I purchased the same plaques from the dollar store, removed the ribbon, and began painting with a "sample" paint I had from painting our house. After I was done painting I was ready to cut out my letters with the cricut and mod podge them on the plaques; however, Mr. Woodsy was not happy with how rough the wood was. So he took them, and sanded them down for me, and then I painted another coat of paint on them. While the paint was drying I decided on the font I wanted to use, and began cutting out the letters using the Jasmine cricut cartridge. I then applied a thin layer of Matte Mod Podge to the panted plaque. I carefully placed the letters on the plaque and let it dry for a good 20 minutes. *Obviously this is the wrong order that the sign should go in. About 20 minutes later I applied another layer of mod podge. Pictured above is the mod podge dried. I then waited MONTHS until I did anything with these inexpensive signs. A few week's ago I finally decided what color ribbon I wanted to use and where I wanted to place these signs. I decided I wanted them to read vertical instead of each sign hanging horizontally. I used one consecutive piece of ribbon as pictured above. After reconfirming that I liked the spacing I removed the bottom sign and placed hot glue on each of the ribbon pieces. I carefully placed the sign on the ribbon (pushing down firmly to make sure that it sticks). Make sure when you are pushing the sign onto the ribbon that it doesn't move and that hot glue doesn't drip over the edge of the ribbon and adhere to your floor (like mine did)! Repeat the last two steps (two more times) until all three signs have been glued to the ribbon. Here is the finished product... except when we went to pick it up the "wash" sign was leaning over. So, I fixed this by adding additional dot of glue towards the top of the ribbon on each side. I consulted with Mr. Woodsy on where I would like it hung, and he went right to work. Here is the final product! Plus, a sneak peak of what's to come (Re-Wrapped Fabric Board)! *This is the only photo I have and it was taken on a camera phone. One of my first sewing projects I attempted after receiving my sewing machine in 2009 was the simple (reversible) tote bag. 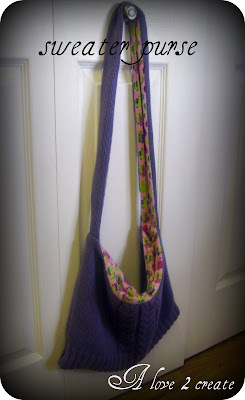 I found a plethora of awesome tutorials from Skip to My Lou, and instantly fell in love with the reversible tote bag. It looked easy and I figured it would be a great first project. This one hour project took me at least a good 3 hours. I think I had to seam rip a good three times, and at one point I had sewn the bag completely shut! In the end it was a great learning experience. *This photo was taken on my camera phone. I made this bag for my sister in-law to house her birthday gifts last year! I used four full fat quarters and a quarter of a fifth fat quarter. This is probably my favorite bag I've made to date, and after making it I never found the same fat quarter pattern again at JoAnn's. I love the contrast of the blue inside the bag. Not sure if you can tell, but the straps have little blue flowers on them that match perfectly with the inside. After almost a year of no tote bag making I made a tote bag for a very special 3 year old's birthday! It housed her birthday gifts, and best of all she now has a new bag to tote around her toys. I used my Fabric Heat-N-Bond application to apply her name and the crown to the bag. I am so pleased on how the letters came out! Here is what the bag looks like when it's inside out. 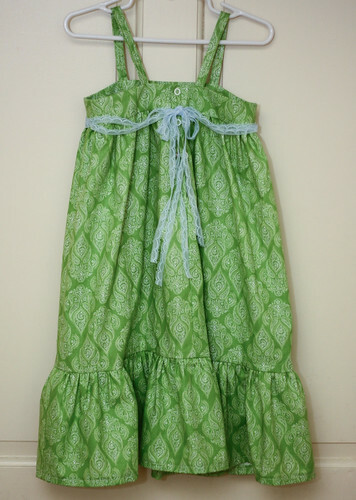 So, if your looking for an easy, beginners, sewing project. This my friends, would be the project for you! Hello, I'm back in town for a few week's which means on my free time I'm totally going to be crafting away! Plus, like I mentioned in my last post, I'm on a mission to find a comforter set and color scheme for my birthday master bedroom makeover! I'm also painting an accent wall in our dining room, and making some curtains for the kitchen window. Hopefully, I'll be successful this weekend in find fabric for the curtains! Oh, and I have a craft lunch at work today! We are making rosettes of all kind! So, stay tuned for that post as well! Since we only had four people link up two week's ago at our last link party I'm featuring the four kind souls that linked up (shame on me for not posting the html to link the party)! lol. If you've never been featured before, please make sure you grab a featured button, and display it proudly on your blog! I can honestly say that I absolutely LOVE all four projects! Great job for posting such amazing projects! Oh my, Catherine, this is amazing! I know just the little girl that would love a dress like this! You've inspired me. Heck, I'd like to make one for myself! lol. A co-worker of mine just brought in a cloth snack baggie that he bought somewhere! I'm all over this! I'm really interested in this fusible vinyl you speak of. 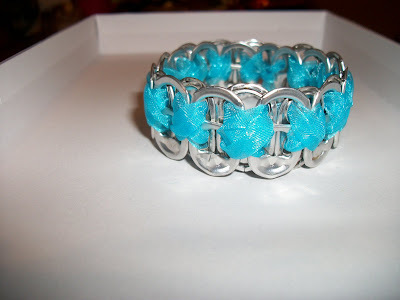 This looks like such an awesome and easy project to make! Everyone in blog land has been making these mirrors. I want to join the cool club and make one too! I just need to figure out where it would go! :) I love the fact that it isn't round and that it's more diamond shape! Fabulous job! Love this coffee collar! I've been wanting to make one forever, and I'm all over this fleece look! Hello, from high in the sky! Last week I was in San Francisco for work and this week I'm in route to New Orleans! With that being said I have had no time to prepare in advance for a link party and/or get one up and running today. I love my iPad, but copying and pasting pictures for features and HTML is about in possible on this marvelous device. The link party will start back up next week, and feature all 4 marvelous projects that linked up last week (due to my lack of copying the html code for the link party in the post). I'd love to report that I've been crafting away, but sadly with two back-to-back business trips, crafting has been put on hold, and Mr. Woodsy has been busy-busy at work! I do have quite a few cool crafts to share that are on back log. One of these days I'll have time to edit photo's and write up tutorials. Oh, and I have two awesome giveaways in the coming months. Other exciting news to report on, my birthday is next month and Mr. Woodsy finally agreed to make a head board for our bed (as my birthday gift). Ever since we moved in our house a year and a half ago I've been wanting to make over our bedroom making it a true master suite and a place to relax and get away from the world. So, hopefully by the end of next month we will have transformed our bedroom into everything I've dreamed of without breaking the bank! The hard part is finding the comforter set, cloth for the head board and bench, and curtains that we will use for this transformation. Along with a new fan, pictures, and paint/wall paper. At least I'll be home the next 3 weeks to concentrate on that project. I the meantime, keep on crating and stop by next Wednesday to link up all your awesome projects. Disclaimer: this blog post was typed on a tablet and may contain spelling errors! OMG! So sorry I did not include the link code for this link party! Words can not express how busy I've been (and the lack of available internet I've had. I've decided to keep the link party open until Sunday... so spread the word and link away! Again... so sorry! I'm on the road today, and all of this week to be exact. I crafted my booty off the past few days leading up to this trip, and got a lot accomplished (but my list never seems to shrink). Mr. Woodsy has been working around the clock and his list is growing by the minute. We keep getting more and more request (from family and friends) for wood cut-outs! In any event, I'm excited to see what everyone has been crafting the past week. Please remember to only link CRAFTS! Nothing else... I do maintain a cooking blog, and if you want to join in on the link parties there you are more than welcome too! Trina, you did a fabulous job on this purse! I've just started going through my closet, and I'm hoping I'll find an old sweater to make into a purse! I have never scene this made before, and I absolutely LOVE IT! I had to really look hard at it to see that they were can tabs. This is so awesome! If I wasn't going out of town I'd totally replicate this; however, I can see my self trying the food coloring trick on other flowers I buy in the near future! Laurie, you did an amazing job on revitalizing this chair! If only I could come up with enough courage to re-cover the chair that I've been meaning to do for the last 8+ months! This is honestly... PURE GENIUS! I have no idea where I would incorporate this into my house, but I need and want to make these! Thank you to everyone who linked up last week and if you were featured please make sure you display a "featured" button proudly on your blog. I first saw this awesome "sweatband" on the Craft Snob's blog. I really liked the fact that I could use any type of terry cloth material, and the fact that I'd finally have a good headband for exercising! I almost bought some terry cloth material, and that's when I had an ah ha moment! Duh, I can just use an old towel, and then I realized that I got a sweat towel from a product review I did a few week's back. Since I had it in my fabric box I decided to cut it up! This was an easy project to complete in less than 30 minutes, and any beginner sewer can easily accomplish this project! Instead of writing the same tutorial over again, I've decided to provide a few pictures of my latest creation! I'm very happy with the end result. I love the color and the best part is that I used material's that I had on hand! *Be prepared if you cut up a new (thicker) towel... you are going to have tons of fuzz every where! Here is the end result... a new sweatband for exercising! Happy first Wednesday of March! I hope everyone had a fabulous weekend... I know we sure did! We celebrated Mr. Woodsy's birthday with a very low key weekend. I've been working on a few crafts that I hope to share in the coming weeks. Fingers crossed I can get them done before I head out of town for work! I might even attempt to start refinishing the chair in my craft room that I've been procrastinating to complete for months, now. Man, could this not have been posted at a more appropriate time. I have been looking at ways to spruce up and decorate the empty space above my tall kitchen cabinets. I own a cricut, and I know we have some scrap wood laying around. I might just have to give this a whirl. Can you believe that I've yet to make a subway art to date? 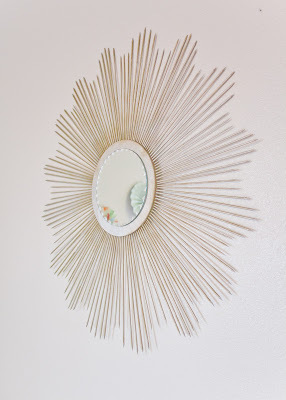 I absolutely love the sunburst mirror, but have no idea where I could incorporate it into my house. So until I figure it out I swoon over everyone who has the chance to make one! This is a great tutorial to follow if you want to make one of your own! Great job on the upcycle project! I could see my friend, Sarah, doing something like this! I will admit I'm very jealous that you own a serger. It's on my "wish" list. I'm so, so, so loving these "lucky bits". I want to make some St. Patrick's day crafts, but since I won't be in town I feel like there is really no point this year... so instead I swoon over everyone else's green projects! Once again, Allie, you've hit the ball out of the ball park on this project! If there is one thing I love to do in this world it's give boring plain-jane-every-day items a makeover! I can't stop looking at this notebook. These would make for a great birthday gift for a teen or an adult (and for pennies)!